Nike Air Max 720 "Spirit Teal" Release Information: Detailed Images - Pop It Records - NEW MUSIC EVERYDAY! 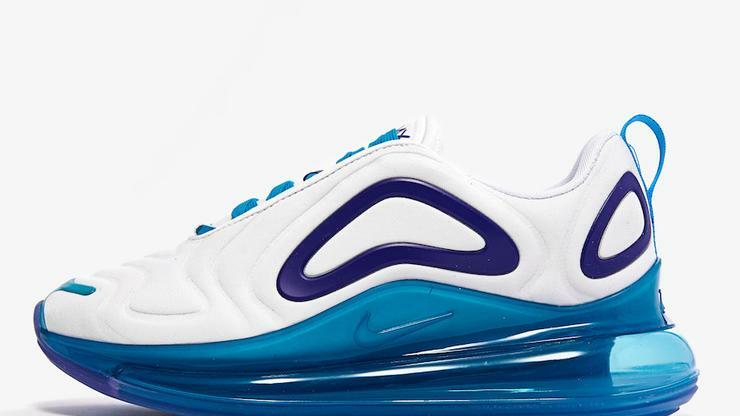 The Nike Air Max 720 has been stunning sneakerheads thanks to its chunky air max unit that wraps all the way around the shoe. It's a genius concept that has made this particular shoe one of the most interesting Air Max models to that. So far it's been a smash hit and there have been . Now, Nike has another model on the way although this one is for women only. Regardless, it's a pretty great colorway. It is currently being dubbed as "Spirit Teal" and features an all-white upper with purple highlights along the side. Meanwhile, the shoe's air max unit and laces come in the aforementioned spirit teal. The combination of colors is pretty interesting and reminds us of a Charlotte Hornets jersey. If you're looking to cop these, they'll be coming out on May 17th at Nike.com and select retailers for $180 USD, according to Sneaker Bar Detroit.